I would rather donate a kidney than have to think about an exit plan for my business. Of course not. But it’s representative of the reaction I get from many owners whenever I mention the E word. Every private business owner has to exit one day. So, if you are sitting on a sizeable asset, you are advised to be well prepared. Prepared to finish strongly, not limp over the finish line, as many do. Retirement is expensive, so maximising the cash you get at exit time should be a no-brainer. Firstly, make sure you have the very best exit team in your corner. Exiting a business is a complicated undertaking. You can’t compare it to selling the family home or other real estate. One misstep can cost you millions. Make sure you have the right valuer for your industry, a tough negotiator, the best tax lawyer and accountant who have done a similar exit to yours. No two exits are the same. Hiring the wrong exit team is among the most common mistakes I see. Example: An owner in regional NSW engaged his suburban solicitor to advise on a complex cross-border transaction. The solicitor had no relevant tax experience and was out of his depth. This added significantly to costs and delayed the deal by 3-months, putting the entire transaction at risk of falling over. The advice is : make sure you have the right people doing the right things right on your exit team! Founder of global investment firm KKR & Co. Henry Kravis is someone worth listening to. He built his $5.5bn personal fortune by buying companies, fixing them up and selling them. Kravis never buys a business without having a clear end-game and a plan to get there. So set a target number and plan for the sale of your business as soon as you can. Especially, if you are sitting on an asset which comprises the bulk of your personal wealth. “I will get around to it one day” is an inexcusable and irresponsible position to take, when others are dependent on the exit. Like Kravis, you need to identify where on the curve you plan to exit and how you will maximise the cash you get. Time it such that revenues and earnings are growing year-on-year. There are other fundamentals a buyer will look at, but these are the two main ones: at least 3 years of strong growth for both revenues and earnings. As in the graph below, you need to find where you are on the curve. Also be able to demonstrate to the buyer the next S-Curve. We call this your STEG – short for Strong End Game. Over the past few months, our team has developed a tool to help business owners get more cash at sale time. We have named this tool STEG – short for STrong End Game. STEG is a combination of McKinsey’s value driver tree model and a valuation methodology used by global investment banks. 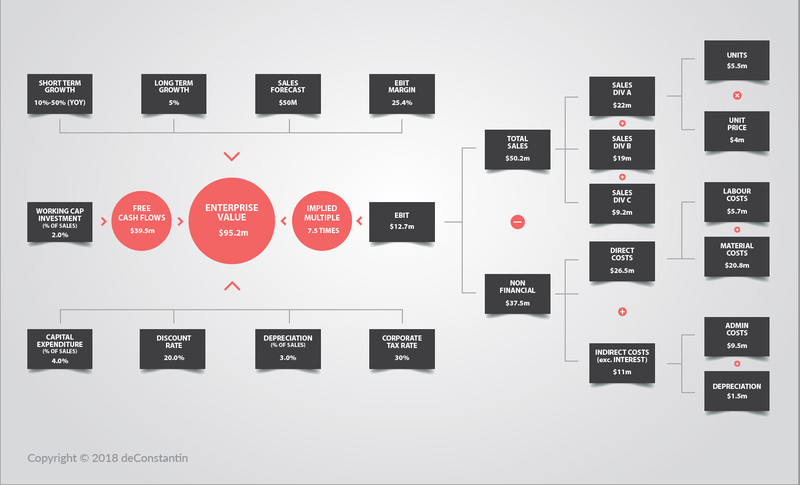 Working from right to left, STEG links a company’s profit tree directly to its valuation – Enterprise Value. A powerful linkage. STEG identifies the important operational drivers for your company to grow profitably. 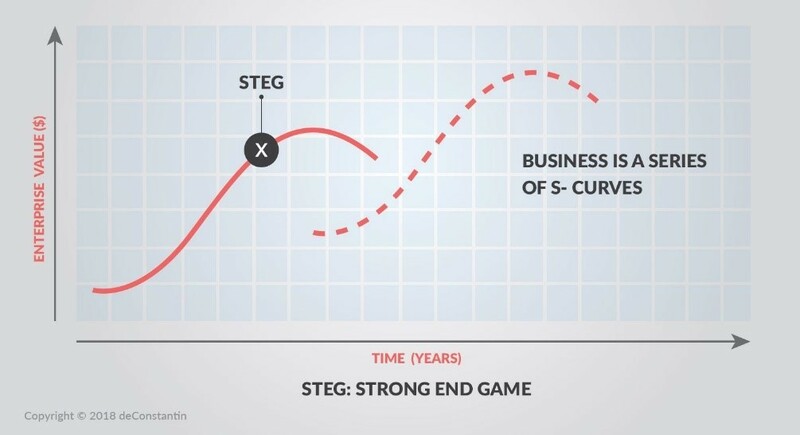 STEG also provides shareholders a clear visual of your company’s end-game and progress towards that number. If you would like a chat and deeper dive on how STEG works, hit the Contact button and enter STEG into the Subject line.